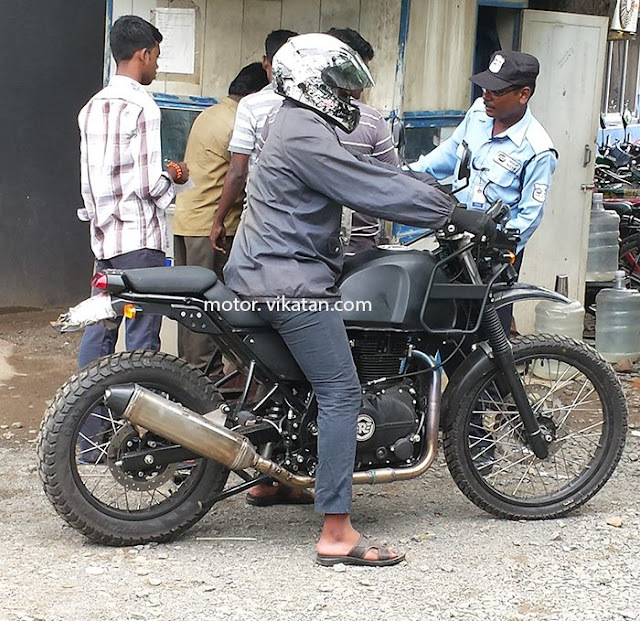 The Royal Enfield Himalayan was spotted again in the wild, and this time we have a clear photo of the new machine the Indian manufacturer is preparing to launch. The battered, rusty disguises used in earlier tests are now a thing of the past, and the bike definitely looks tidier and neater. Himalayan now sports a nice black frame, black forks and rims, and the entire engine is also black, including the covers. We have no info on how the bike will be equipped in stock trim, but we have seen it both with and without the rear luggage racks, while the front ones were always in place. If anything, we might guess that the front luggage racks are standard, and they might even serve as crash protectors to some degree. The fuel tank seems to be in its final shape, and it retains the classic design of other Royal Enfield or retro-ish bikes. We expected a design that would accommodate tankbags more easily, but it looks like RE thinks that the two front cargo racks are enough. Frankly, straight from the very first time we saw the bike, we thought that the exhaust of the Himalayan was never a strong point. It DOES come as a major step from what Royal Enfield used to deliver, but at the same time, it looks a bit fragile. This photo shows us that the silencer is attached to a fixture of the passenger peg mount, and this means it extends a significant way to the right side of the bike. Dropping the Himalayan on the right side could, therefore, deal a lot of damage to the exhaust system, possibly with critical results. 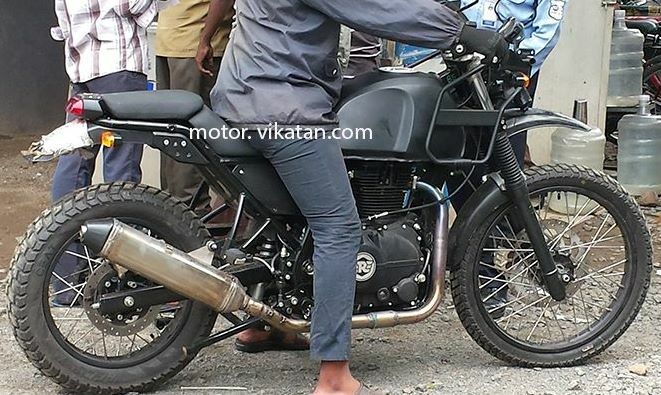 With the very Dakar-ish rear subframe of the Royal Enfield Himalayan, a smaller, shorter and possibly narrower/oval silencer could be routed differently and out of harm's way. At the same time, this would make the rear section of the bike look sportier and much more appealing to the customers in the Western markets, where Royal Enfield aims to increase their presence. As for the swingarm, seeing RE upgrading from the dual shock setup to a monoshock suspension is really neat. Still, the swingarm looks a bit fragile, especially if we picture a fully-loaded bike being ridden hard on rough, uneven and rocky terrain. As for the front fender, the opinions are mixed, and we are waiting for the final version The new RE machine looks like being very close to the production stage, and we can expect to see the definitive version soon. Stay tuned.